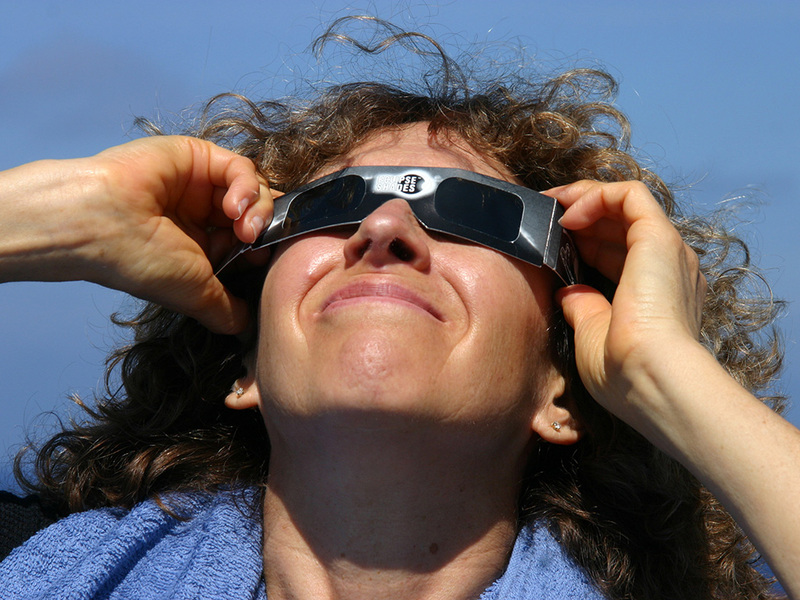 In response to alarming reports of potentially unsafe eclipse viewers flooding the market as the coast-to-coast solar eclipse of August 21st draws near, the American Astronomical Society (AAS) has revised some of its safety advice to the public. How can you tell if your “eclipse glasses” or handheld solar viewers are safe? It is no longer sufficient to look for the logo of the International Organization for Standardization (ISO) and a label indicating that the product meets the ISO 12312-2 international safety standard for filters for direct viewing of the Sun’s bright face. Why not? Because it now appears that some companies are printing the ISO logo and certification label on fake eclipse glasses and handheld solar viewers made with materials that do not block enough of the Sun’s ultraviolet, visible, and infrared radiation to make them truly safe. Some sellers are even displaying fake test results on their websites to support their bogus claim of compliance with the ISO safety standard. Given this unfortunate situation, the only way you can be sure your solar viewer is safe is to verify that it comes from a reputable manufacturer or one of their authorized dealers. The AAS Solar Eclipse Task Force has been working diligently to compile a list of such vendors, now posted on its Reputable Vendors of Solar Filters & Viewers page. Task-force members have checked manufacturers’ ISO paperwork to make sure it is complete and that it comes from an accredited testing facility, and they’ve asked manufacturers to identify their authorized resellers and dealers to identify the source of the products they’re selling. Only when everything checks out does the AAS add a vendor to its listing. How can you tell if your solar viewer is not safe? You shouldn't be able to see anything through a safe solar filter except the Sun itself or something comparably bright, such as the Sun reflected in a mirror, a sunglint off shiny metal, the hot filament of an unfrosted incandescent light bulb, a bright halogen light bulb, a bright-white LED bulb (including the flashlight on your smartphone), a bare compact fluorescent (CFL) bulb, or an arc-welding torch. All such sources (except perhaps the welding torch) should appear quite dim through a solar viewer. If you can see shaded lamps or other common household light fixtures (not bare bulbs) of more ordinary brightness through your eclipse glasses or handheld viewer, and you're not sure the product came from a reputable vendor, it's no good. Safe solar filters produce a view of the Sun that is comfortably bright (like the full Moon), in focus, and surrounded by dark sky. If you glance at the Sun through your solar filter and find it uncomfortably bright, out of focus, and/or surrounded by a bright haze, it's no good. You should contact the seller and demand a refund or credit for return of the product, then obtain a replacement from one of the sources listed on our reputable-vendors page. Remember that a genuinely safe solar viewer does more than reduce the Sun's visible light to a comfortable brightness level. It also blocks potentially harmful UV and IR radiation. The only way to tell whether your viewer does that is to be certain that it meets the ISO 12312-2 safety standard, and the only way to know that is to be certain that it came from a reputable vendor. What if you received eclipse glasses or a handheld solar viewer from a relative, friend, neighbor, or acquaintance? If that person is an amateur or professional astronomer — and astronomers have been handing out eclipse viewers like Halloween candy lately — they’re almost certainly ISO-compliant, because astronomers get their solar filters from sources they know and trust (in other words, from the ones listed on the AAS’s reputable-vendors page). Ditto for professional astronomical organizations, including college and university physics and astronomy departments, and amateur-astronomy clubs. If you bought or were given eclipse viewers at a science museum or planetarium, or at an astronomy trade show, again you’re almost certainly in possession of ISO-compliant filters. As long as you can trace your filters to a reputable vendor or other reliable source, and as long as they have the ISO logo and a statement attesting to their ISO 12312-2 compliance, you should have nothing to worry about. What you absolutely should not do is search for eclipse glasses on the internet and buy whatever pops up in the ads or search results. Check the AAS list of reputable vendors and buy from one of them. The AAS continues to emphasize that it is perfectly safe to look directly at the Sun during the brief total phase of the solar eclipse (“totality”), when the Moon entirely blocks the Sun’s bright face. On August 21st this will occur only within a roughly 70-mile-wide path spanning the country from Oregon to South Carolina, and only for up to 2 minutes 40 seconds. Before and after totality, or throughout the entire eclipse if you’re outside the path (in which case you’ll see only a partial eclipse, which is nowhere near as exciting or magnificent as a total one), the only safe way to look directly at the Sun is through special-purpose solar filters. 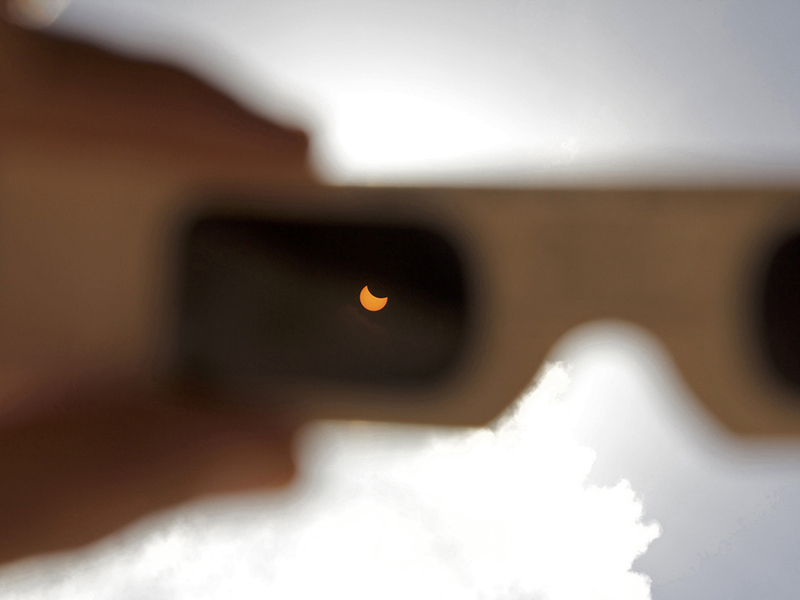 These are commonly sold as paper- or plastic-framed eclipse glasses or cardboard solar viewers that you hold in your hand. Ordinary sunglasses, even very dark ones, are not safe for looking directly at the Sun; they transmit many thousands of times too much sunlight. Always inspect your solar filter before use; if scratched, punctured, torn, or otherwise damaged, discard it. Read and follow any instructions printed on or packaged with the filter. Similarly, do not look at the Sun through a camera, a telescope, binoculars, or any other optical device while using your eclipse glasses or handheld solar viewer — the concentrated solar rays could damage the filter and enter your eye(s), causing serious injury. Some eclipse glasses and solar viewers, even new ones, are printed with warnings stating that you shouldn’t look through them for more than 3 minutes at a time and that you should discard them if they are more than 3 years old. Such warnings are outdated and do not apply to eclipse viewers compliant with the ISO 12312-2 international safety standard, which was adopted in 2015. If your eclipse glasses or viewers are relatively new and are ISO 12312-2 compliant, you may look at the uneclipsed or partially eclipsed Sun through them for as long as you wish. Furthermore, if the filters aren’t scratched, punctured, or torn, you may reuse them indefinitely. What about welding filters? The only ones that are safe for direct viewing of the Sun with your eyes are those of Shade 12 or higher. These are much darker than the filters used for most kinds of welding. If you have an old welder’s helmet around the house and are thinking of using it to view the Sun, make sure you know the filter’s shade number. If it’s less than 12 (and it probably is), don’t even think about using it to look at the Sun. Many people find the Sun too bright even in a Shade 12 filter, and some find the Sun too dim in a Shade 14 filter — but Shade 13 filters are uncommon and can be hard to find. The AAS’s Reputable Vendors of Solar Filters & Viewers page doesn’t list any suppliers of welder’s filters, only suppliers of special-purpose filters made for viewing the Sun. An alternative method for safe viewing of the partially eclipsed Sun is indirectly via pinhole projection. For example, cross the outstretched, slightly open fingers of one hand over the outstretched, slightly open fingers of the other, creating a waffle pattern. With your back to the Sun, look at your hands’ shadow on the ground. The little spaces between your fingers will project a grid of small images on the ground, showing the Sun as a crescent during the partial phases of the eclipse. Or just look at the shadow of a leafy tree during the partial eclipse; you’ll see the ground dappled with crescent Suns projected by the tiny spaces between the leaves. The AAS, established in 1899, is the major organization of professional astronomers in North America. The membership (approx. 8,000) also includes physicists, mathematicians, geologists, engineers, and others whose research interests lie within the broad spectrum of subjects now comprising contemporary astronomy. The mission of the American Astronomical Society is to enhance and share humanity’s scientific understanding of the universe, which it achieves through publishing, meeting organization, education and outreach, and training and professional development. Note added 15 August 2017: This release has been modified since it was originally posted on 1 August 2017 to clarify what you should be able to see through a safe solar filter.